Benhart is a warrior from the land of Jugo, a desertous land filled with massive corrosive ants, sorcery and "honorable fighting men". 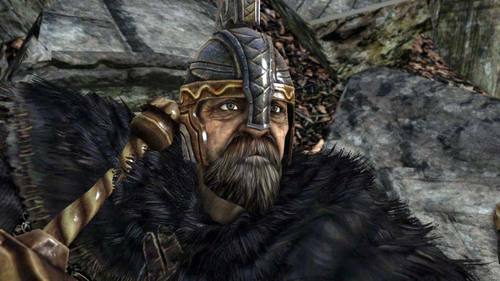 He has traveled from land to land eventually reaching Drangleic, claiming he is on a mission to perfect his swordsmanship. It would appear that if Jugo has an official order of knights, Benhart was not part of it. He wears armor almost identical to Creighton of Mirrah, and based upon descriptions of his armor pieces, it is implied that much of his attire was collected during his travels (much like the player character). Only his small shield and sword were originally his. The shield is emblazoned with a family crest that has been around for several generations, while his sword too has been in his family for generations. It is not too difficult to draw some conclusions. Benhart's family were once powerful. They may have been nobility, but at some point they have fallen from grace and privilege, keeping only what was too precious to give away. They kept their family crest as a reminder of their bloodline and the sword, as they believed it was born from moonlight and held great power, an item too precious to lose. It may be that the family acquiring the sword and their loss of privilege are intertwined. Perhaps an ancestor of Benhart's squandered the family fortune on a weapon that they believed was unique and powerful, or perhaps this weapon was stolen from a higher lord of the land. Whatever the case, Benhart believes in his sword, and somehow it has become tied to the redemption of his family in his mind. If he can just unlock its true power, he can return to Jugo and restore his family's honor and privilege. Many in the land of Drangleic observe his sword to be wondrous, but on closer inspection realize that is fraudulent, a truth Benhart is too stubborn to see. So it seems that Benhart is on a futile mission, destined to wander from land to land dying upon his sword. And we can see that the parma has the horns of a stag emblazoned upon it. So how is it that Creighton came to be wearing armor that so closely correlates to Benhart? Benhart is a travelling warrior who has picked up his armor on his travels. He is also perhaps a famous warrior, as everywhere he goes he leaves people talking about his ‘legendary’ blue sword. It therefore seems possible that Benhart made his way to Mirrah in his travels and perhaps fought there, in an attempt to tease out the true strength of his weapon. We know that Jugo is to the far east and Mirrah to the east, so geographically it would seem that one must pass through Mirrah on their way to Drangleic when travelling from Jugo. In Mirrah, knights who distinguish themselves on the battlefield become famous. It therefore is likely, if Benhart ever went there, that he became famous in Mirrah. Creighton, wanting to draw suspicion away from himself after escaping prison may have at one stage attempted to impersonate Benhart. Creighton’s armor has some “odd differences that catch the eye”. Does this line refer to the crest of Benhart? Both Creighton and Benhart give you the same reason for coming to Drangleic: to hone their blade. While this certainly rings true for Benhart, it sounds hollow coming from Creighton. While there are certainly reasons against this, such as Creighton never introducing himself as Benhart, and the fact that it does not seem wise to imitate someone so famous for their conspicuous blue sword without carrying said blue sword, there is certainly an interesting connection between the two characters that remains unexplained. It should be noted that in the unused content of the game, Creighton is seen wielding Benhart’s sword. We do not know how he came upon it, but it may be that this lends support to the idea that Creighton is trying to impersonate Benhart. Whether or not Benhart is Undead it would appear his true purpose in coming to Drangleic is to unlock the power of his family sword. He says: "They say that no man has ever teased oot the sword's true power. But in the right hands…Heh heh heh heh heh heh…", so it's clear that he believes the sword to hold a power that is yet to be unlocked. He claims on repeated occasions that he came to test his swordsmanship in Drangleic, and in a sense this is true. But what he truly desires is power, and he sees the powerful creatures in Drangleic as a means to unlock that power in his family heirloom. He believes the sword was made from moonlight, and perhaps he heard somewhere that in Tseldora there are remnants of a Pale Beast that holds answers to unlocking his sword's power. This is why he is found at the entrance to the Shaded Woods right from the beginning of the game. Finding no answers there, he seeks out the king. When he discovers the King gone, he seeks out the past in the Memories of the sleeping giants. Benhart's reasons for being in Drangleic are nebulous and seemingly quite shallow. However, by paying attention to where he is encountered, it is possible to discover the true conclusion to his story. 1. He can be encountered in the Giant's Memories, which means that he must have visited the Ancient Dragon (most likely after the Bearer of the Curse). 2. He fights the Giant Lord, meaning that he presumably obtained the Giant's Kinship (since it's not a tangible object there is no reason to believe that only one person can have it). 3. He can be summoned at the Throne of Want. Why would he be there, with the Kinship, if not to take the Throne? 4. If the Bearer of the Curse chooses to leave the Throne then Benhart is the only person who could possibly take the Throne. 5. Benhart's Shield has been seen in the playable demos for Dark Souls 3, implying that he will be referenced in that game. 6. It's also interesting from a narrative standpoint. Benhart is first met at the entrance to the Shaded Woods, unable to proceed because of a "statue". Following this theory, his endgame sees him proceeding with the help of some "statues", which form a bridge to the Throne. Characterized by the pride he exudes in both his armor and his iconic blade, despite it's questionable authenticity, Benhart of Jugo is our lovable oaf of Dark Souls 2. 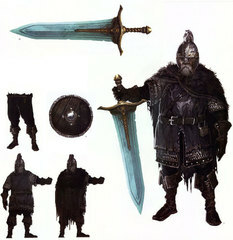 Found throughout various points as the player progresses through Drangleic, Benhart is seen with his prized sword always at his side ready to inform the player on what makes a "true man", especially when insisting that only such a real man as himself can wield such a supposedly great sword. However, the player is likely to sense a sort of disingenuousness in Benhart's character. Not only do we discover that Benhart's sword is indeed a fake, but Benhart's adoration of his own Mirrah armor lacks any real achievement that one might expect of a Mirrah knight. In other words, Benhart's prized possessions are not earned, but inherited. Yet Benhart is quite admirable in both his ability as a warrior and the passion he expresses in upholding himself as the honorable hero he would like to be. One can't help but feel a fondness toward Benhart of Jugo even despite the fact that he might not be the "true man" he sees himself as. Perhaps the legitimacy of his equipment does not a matter, and it is instead the warrior underneath all the equipment that matters. In Japan, they generally view weapons (like a gun, or in this case a blade) not as a tool, but as an extension of the self. That would underline the idea of it not mattering whether his blade is real or not; he just has to be "in tune" with it. "Have you business with me? Heavens above. Who thought it a good idea to put it there!" "Ohhhh, I'm in quite the pickle now. See that statue? Gives me the willies. Stare at it for long enough, it starts to look alive. Hey, you don't think a real-life person was turned to stone, do you?" "What?! Clearing the way was your doing, was it? The road ahead's gonna be long, but I'm here to help. Gah hah hah hah hah!" "I am in yer debt. I swear it, by my ancient sword." Good to see you well. Yes, hehh hehh, very good indeed." "I journeyed from the distant east to perfect my swordsmanship. I may face any manner of man or beast, but none shall be a match for my sword. Heh heh heh heh…"
"This land is a right mess, eh? No better place to test my sword, ey? Heh heh heh heh…"
"Well, we meet again! What you doing here? Fate just won't let us stay apart, will she? Gah hah hah hah hah hah!" "See the old sword's caught your attention? Well, you've a good eye, then. But in the right hands…Heh heh heh heh heh heh…"
"I see you've taken a liking to the sword. Well, I applaud you, for you've a sharp eye. Then you will have to pry it from my cold hands! Gah hah hah hah hah hah!" "I've a great debt to you. And I'll never forget it. I, Benhart, swear by my honour, to aid you in your darkest hour! So nae problem pal." "Oh! Look at you! Old friend! Just remember, I'm always ready to help." "My homeland is in the far east. A kingdom of honourable fighting men. I know how swords think, you see! Gah hah hah hah!" "We have outwitted death a good many times. Huh huh, My dear friend, take these." "Very well. I, Benhart, will be honoured to chop you to pieces." "You knew this would happen…"
"You're a sorry waste of life…"
"A man's journey…is never done…"
"Hey, You know that odd fellow? With the hulking blue sword. He talks really highly of it, but I got a feeling it's a fake. I didn't want to disappoint him, so I just sort of talked around it. Let me just say, there are lots of "legendary swords" out there." Small shield of Benhart of Jugo. This parma, emblazoned with a family crest of some sort, has clearly been around for several generations, but has no special value. Armor of unknown origin. Belonged to Benhart of Jugo. Apparently Benhart found this while wandering land to land, but its origins are unknown. He wore it all the time, he adored it so, leaving a slight odor.